Fruits, The International Journal of Tropical and Subtropical Horticulture (ISSN 0248-1294 print and ISSN 1625-967X electronic), a leading scientific journal, published by the International Society for Horticultural Science in close collaboration with CIRAD (France). The journal publishes original articles and reviews on tropical and subtropical horticultural crops. seed science and agricultural engineering. Fruits, The International Journal of Tropical and Subtropical Horticulture, deals with such crops as vegetables, fruits, spices, ornamentals and medicinal plants growing in the tropical and subtropical environment. 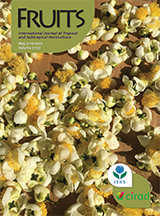 Fruits - the International Journal of Tropical and Subtropical Horticulture is available online and in print. Check here for pay-per-view options to purchase individual paper downloads. For 2018 (Volume 73) the subscription price for Fruits, the International Journal of Tropical and Subtropical Horticulture (Volume 73 - 6 issues, 2017) is EUR 650. Subscriptions include postage of 6 high-quality print issues a year as well campus-wide unlimited online access to the entire journal archives, current and back-issues. Commercial discounts available to booksellers, subscription agents & ISHS institutional members. Click here to contact ISHS with your subscription-related questions. Fruits, The International Journal of Tropical and Subtropical Horticulture does not charge article submission or article processing charges (APC). For those authors who require their paper published Open Access, the ISHS offers optional 'Gold' Open Access for this journal. The cost for this optional Open Access is EUR 1,300 per paper (-25% discount for ISHS members). Download the optional Open Access order form here.